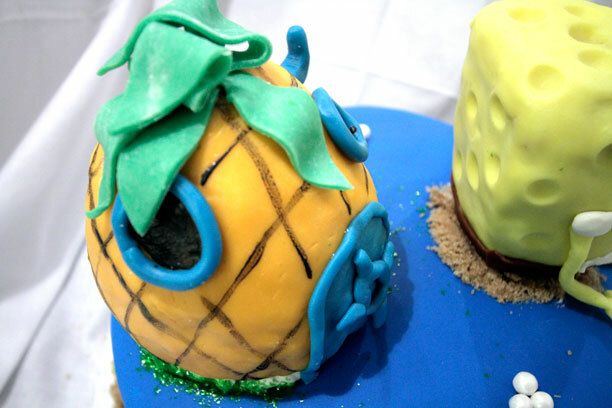 Who lives in a pineapple on top of a cake? I was asked to make a birthday cake for my neighbors two kids. They have a lot of varied interests but one consistant theme for them is their love of Spongebob. 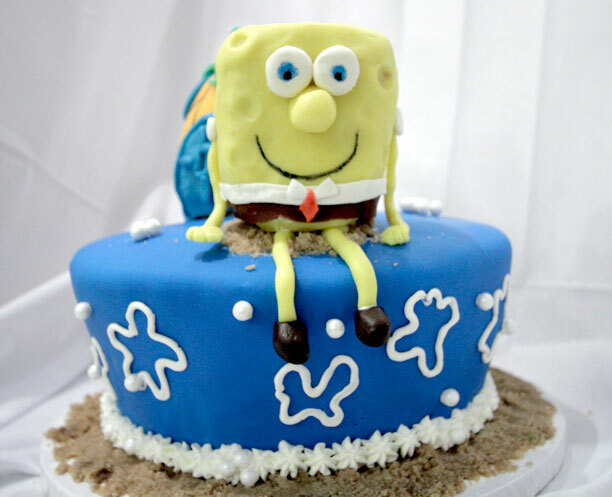 That seemed like a natural choice for a cute kid’s cake. I made Spongebob and the pineapple out of rice krispies and covered them both in modeling chocolate. This was a challenge. I hadn’t really worked with modeling chocolate before and I decided to make my own. The problem with modeling chocolate is that you need to let it sit overnight at room temperature before you use it. I didn’t have that luxury. So I put it in our beverage fridge which isn’t quite as cold as a regular refrigerator just to get it cooler quicker. But unfortunately when you force modeling chocolate to cool quickly, it has a tendency to separate and get oily. 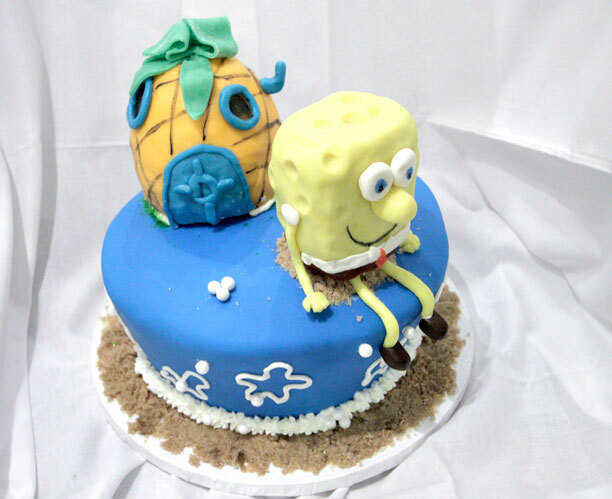 I managed to salvage enough modeling chocolate to cover Spongebob and the pineapple but it was a challenge. For the cake, I made a chocolate cake with chocolate frosting. I carved into the cake to give it that cute shape which I think was perfect for a fun, 1 tiered cake. I finished the cake with brown sugar “sand” and royal icing shapes with pearl dragées. I made the “foam” at the bottom with white buttercream. I also found this really cute green edible glitter that really looked like seaweed. This cake came out really cute and I hope they enjoyed it.